Roger Pielke Jr.'s Blog: What Does Pielke Think About This? I think this is inappropriate. It leads the reader into interpreting recent events in a particular way without providing supporting information. This suggestion, that the losses in 2004and 2005 draw Pielke's results into question, needs to be supported with a reference or a solid in chapter assessment. What does Pielke think about this? A previous normalisation of losses, undertaken for U.S. hurricanes by Pielke and Landsea (1998) and U.S. floods (Pielke et al., 2002) included normalising the economic losses for changes in wealth and population so as to express losses in constant dollars. 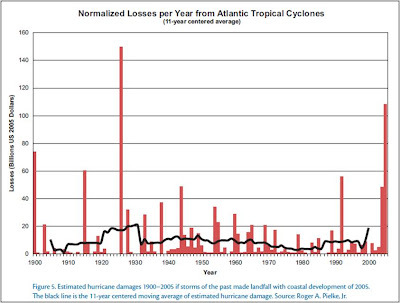 These previous national U.S. assessments, as well as those for normalised Cuban hurricane losses (Pielke et al., 2003), did not show any significant upward trend in losses over time, but this was before the remarkable hurricane losses of 2004 and 2005. 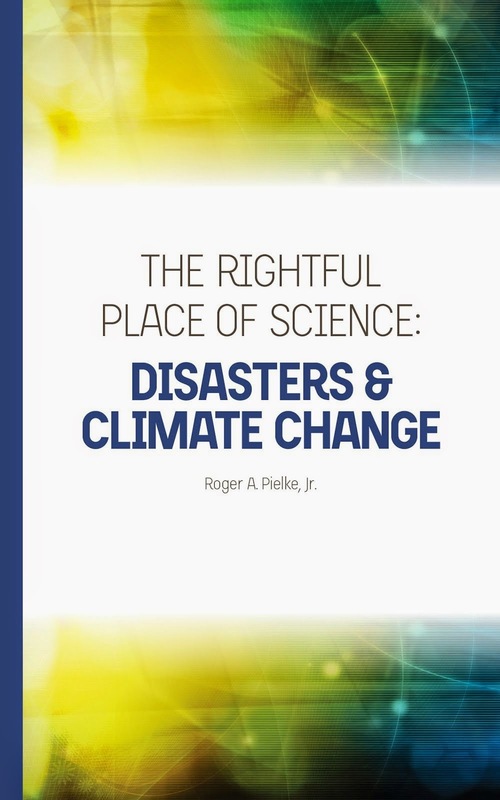 I believe Pielke agrees that adding 2004 and 2005 has the potential to change his earlier conclusions – at least about the absence of a trend in US Cat losses. These comments speculating on my views were made by the IPCC in August, 2006. Coincidentally enough, in March, 2006 I gave the Roger Revelle Commemorative Lecture at the Smithsonian Museum of Natural History in Washington, DC, sponsored by the Ocean Studies Board of the U.S. National Academy of Sciences. My lecture was subsequently published as an article in the journal Oceanography (here in PDF) in June, 2006, two months before the IPCC made its speculative claims about my views, and thus in principle readily available to the IPCC. In any case, I'm not hard to find. The case of hurricane impacts in the United States is similarly instructive. Consider economic damage (adjusted for inflation) related to hurricane landfalls in the United States, 1900–2005, as shown in Figure 4. Although damage is growing in both frequency and intensity, this trend does not reflect increased frequency or strength of hurricanes. In fact, while hurricane frequencies have varied a great deal over the past 100+ years, they have not increased in recent decades in parallel with increasing damages. To the contrary, although damage increased during the 1970s and 1980s, hurricane activity was considerably lower than in previous decades. To explain the increase in damage, it is therefore necessary to consider factors other than variability or change in climate. Society has changed enormously during the past century and coastal development has taken pace at an incredible pace. Given the significance of societal change in trends of hurricane damage, one way to present a more accurate perspective on such trends is to consider how past storms would affect present society. We developed a methodology for ‘‘normalizing’’ past hurricane damage to present-day values (using wealth, population, and inflation). Figure 5 shows the historical losses of Figure 4 normalized to 2005 values. One important reason for some confusion among scientists stems from a claim made by the IPCC Working Group II (IPCC, 2001b) attributing some part of the trend of increasing disaster losses to changes in climate. However, upon closer look, the claim seems unfounded. So not only did the IPCC AR4 WGII egregiously misrepresent the science of disasters and climate change, but when questions were raised about that section by at least one expert reviewer, it simply made up a misleading and false response about my views. Not good.